This ivory replica of the University of California – Berkeley Campanile Tower was handmade in Hong Kong sometime between 1967 & 1972 and sold on eBay recently. 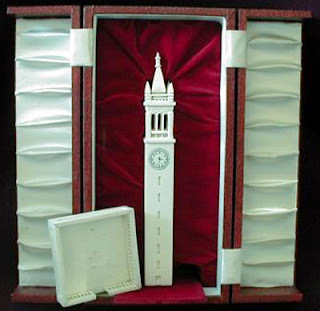 According to the auction listing, “similar ivory towers were given to academic retirees in the Chemical Engineering Department at Berkeley.” This souvenir building tower came with its original red velvet lined box. The official name is Sather Tower, but well known as the ‘Campanile,’ it’s a free-standing bell tower buit in 1914 and stands 307 feet tall. Inspiration for the architecture came from the campanile of San Marco in Venice. It has become the most widely-recognized architectural symbol of UC Berkeley. An elevator lifts visitors to a 200-feet tall observation deck and provides a spectacular view of the entire campus and Bay Area. The Campanile contains a sixty-one bell carillon and concerts take place everyday. Designer John Galen Howard wanted the tower to "rise with a slender stem, bursting into bloom at the summit." Other souvenir versions of the Campanile tower have been made in years past in various sizes and materials.